Plantain plant, Plantago major, is sometimes known as Common Plantain, Large Leafed Plantain or Broad Leafed Plantain. A particularly good poulticing herb (this plant can really pull). Called Weybroed by the Anglo-Saxon, it was one if their nine sacred herbs. A gentle yet persistent antimicrobial and anti-inflammatory action. Young leaves are a good addition to salads at any time of year. 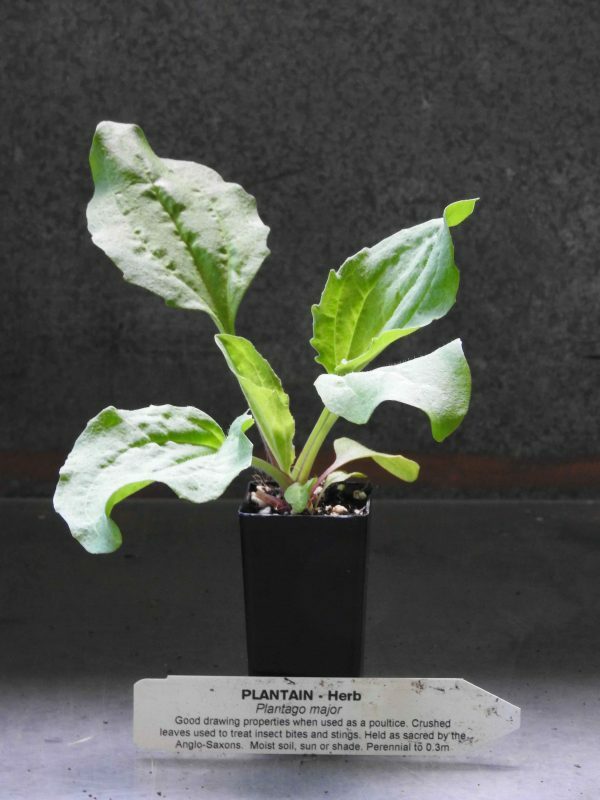 Plantain plant is native to Europe and North America and is adaptable to most soils and positions. Drought and frost tolerant. A perennial, growing to 0.6m x 0.3m. Be the first to review “Plantain, plant” Click here to cancel reply.